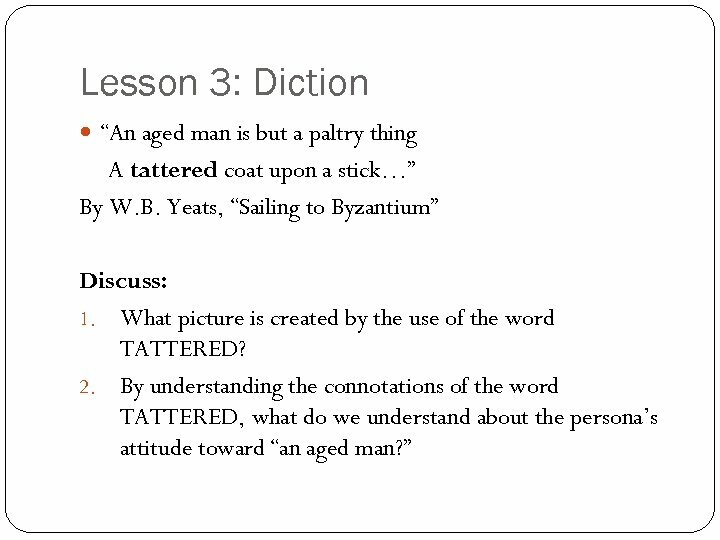 Lesson 1: Diction “Art is the antidote that can call us back from the edge of numbness, restoring the ability to feel for another. ” By Barbara Kingsolver, High Tide in Tuscon Discuss: 1. By using the word antidote, what does the author imply about the inability to feel for another? 2. 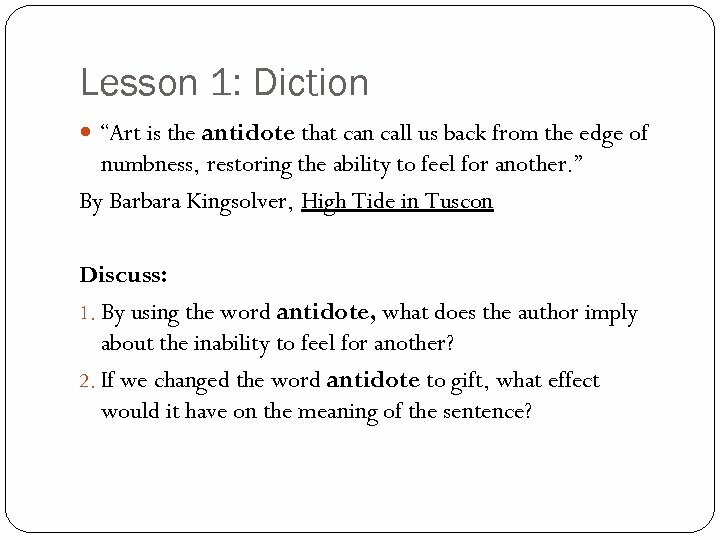 If we changed the word antidote to gift, what effect would it have on the meaning of the sentence? Lesson 2: Diction “As I watched, the sun broke weakly through, brightened the rich red of the fawns, and kindled their white spots. ” By E. B. White, “Twins, ” Poems and Sketches of E. B. White Discuss: 1. What kind of flame does KINDLED imply? 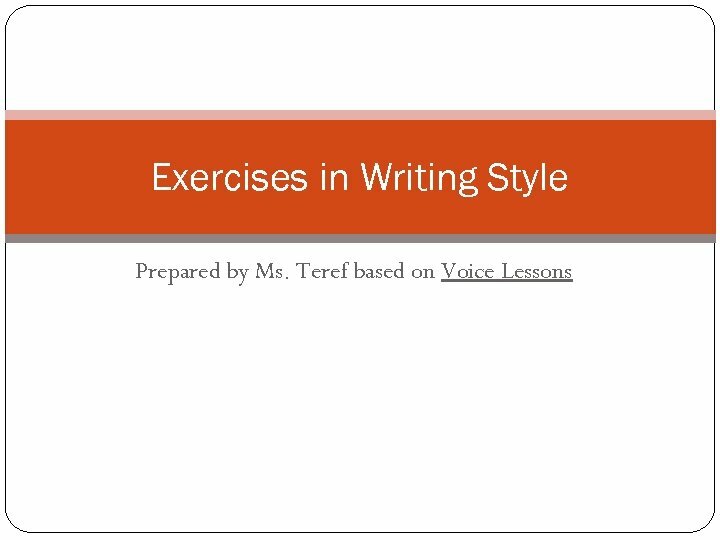 How does this verb suit the purpose of the sentence? 2. Would the sentence be strengthened or weakened by changing “the sun broke weakly through” to “the sun burst through? 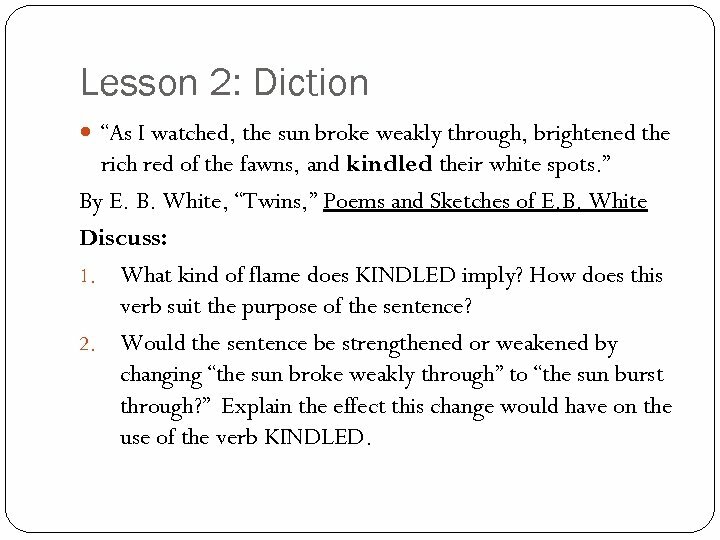 ” Explain the effect this change would have on the use of the verb KINDLED. 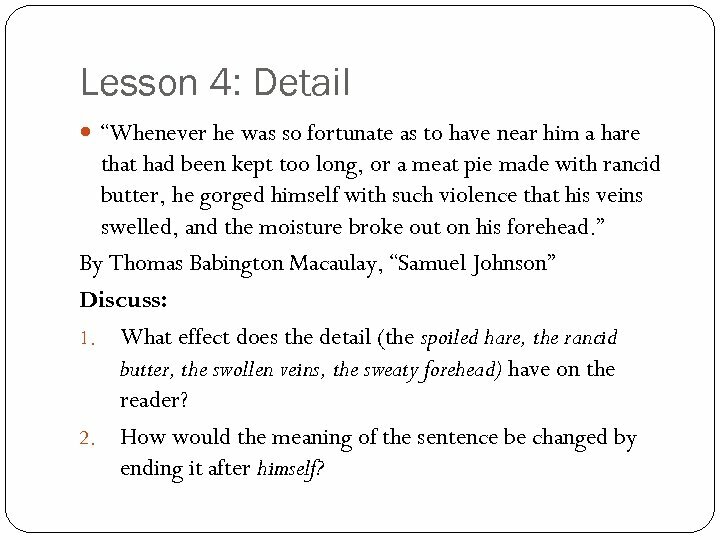 Lesson 4: Detail “Whenever he was so fortunate as to have near him a hare that had been kept too long, or a meat pie made with rancid butter, he gorged himself with such violence that his veins swelled, and the moisture broke out on his forehead. ” By Thomas Babington Macaulay, “Samuel Johnson” Discuss: 1. What effect does the detail (the spoiled hare, the rancid butter, the swollen veins, the sweaty forehead) have on the reader? 2. How would the meaning of the sentence be changed by ending it after himself? 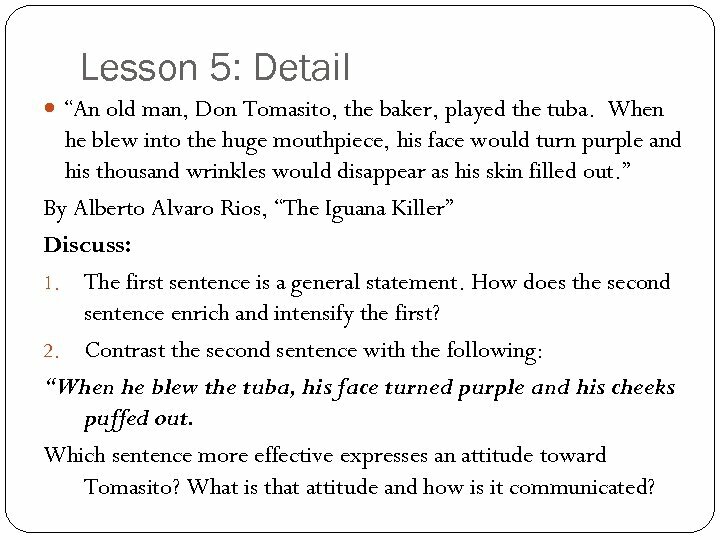 Lesson 5: Detail “An old man, Don Tomasito, the baker, played the tuba. When he blew into the huge mouthpiece, his face would turn purple and his thousand wrinkles would disappear as his skin filled out. ” By Alberto Alvaro Rios, “The Iguana Killer” Discuss: 1. The first sentence is a general statement. How does the second sentence enrich and intensify the first? 2. Contrast the second sentence with the following: “When he blew the tuba, his face turned purple and his cheeks puffed out. Which sentence more effective expresses an attitude toward Tomasito? What is that attitude and how is it communicated? 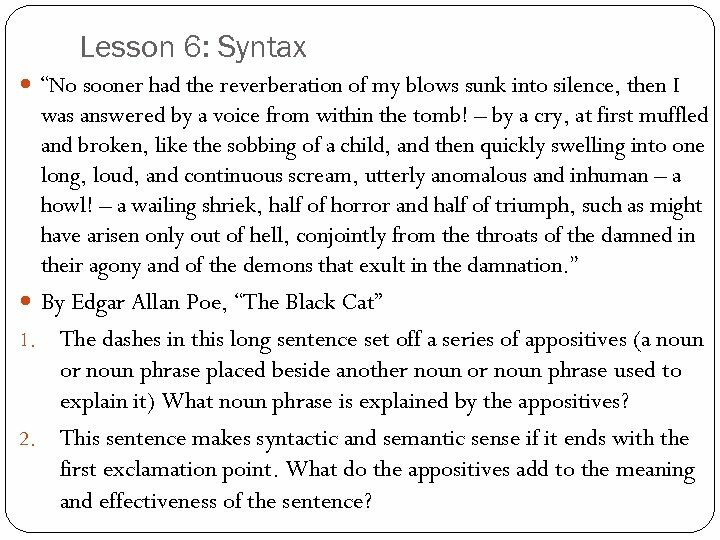 Lesson 6: Syntax “No sooner had the reverberation of my blows sunk into silence, then I was answered by a voice from within the tomb! – by a cry, at first muffled and broken, like the sobbing of a child, and then quickly swelling into one long, loud, and continuous scream, utterly anomalous and inhuman – a howl! – a wailing shriek, half of horror and half of triumph, such as might have arisen only out of hell, conjointly from the throats of the damned in their agony and of the demons that exult in the damnation. ” By Edgar Allan Poe, “The Black Cat” 1. The dashes in this long sentence set off a series of appositives (a noun or noun phrase placed beside another noun or noun phrase used to explain it) What noun phrase is explained by the appositives? 2. This sentence makes syntactic and semantic sense if it ends with the first exclamation point. What do the appositives add to the meaning and effectiveness of the sentence? 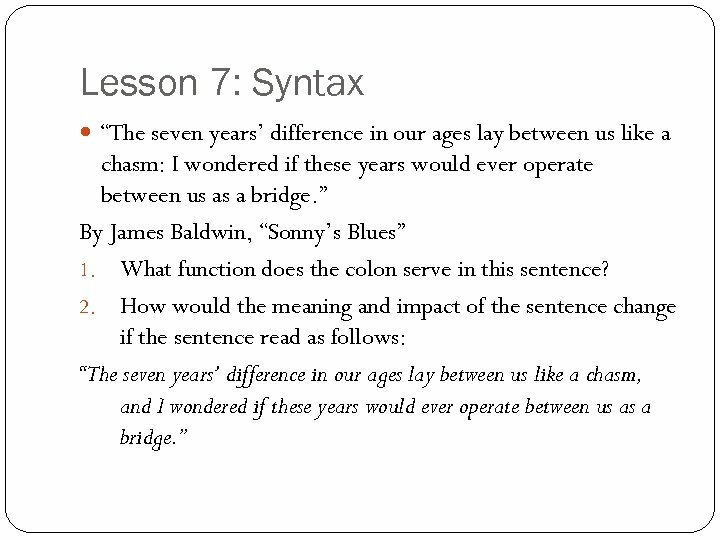 Lesson 8: Syntax “He had been prepared to lie, to bluster, to remain sullenly unresponsive; but, reassured by the good-humored intelligence of the Controller’s face, he decided to tell the truth, straightforwardly. ” By Aldous Huxley, Brave New World 1. What effect does the repetition of infinitives (to lie, to bluster, to remain) in the first clause have on the meaning of the sentence? How do these infinitives prepare you for the infinitive phrase (to tell the truth) in the second clause. 2. 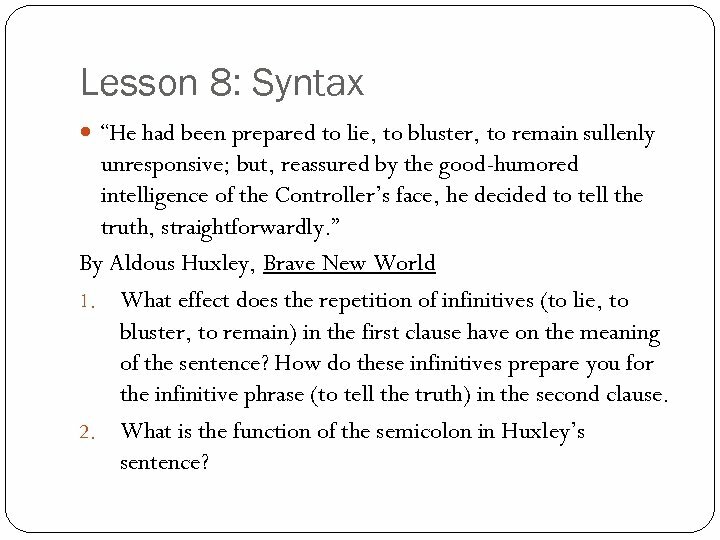 What is the function of the semicolon in Huxley’s sentence? Lesson 9: Syntax “When I am too sad and too skinny to keeping, when I am a tiny thing against so many bricks, then it is I look at trees. 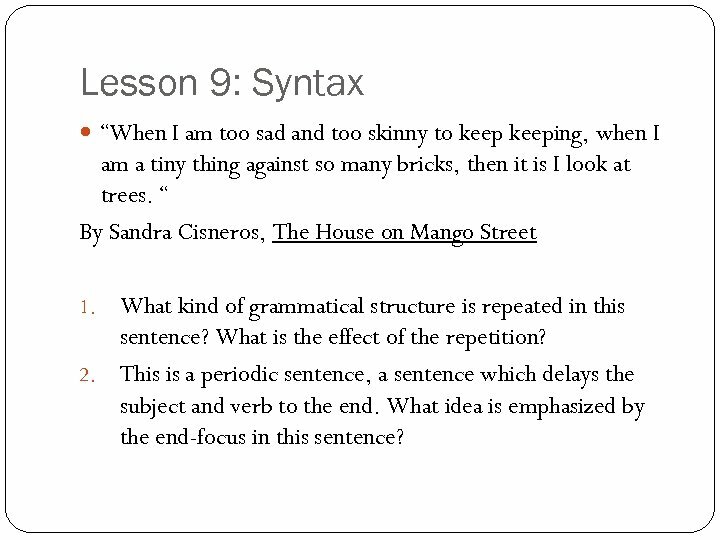 “ By Sandra Cisneros, The House on Mango Street What kind of grammatical structure is repeated in this sentence? What is the effect of the repetition? 2. This is a periodic sentence, a sentence which delays the subject and verb to the end. What idea is emphasized by the end-focus in this sentence? 1. 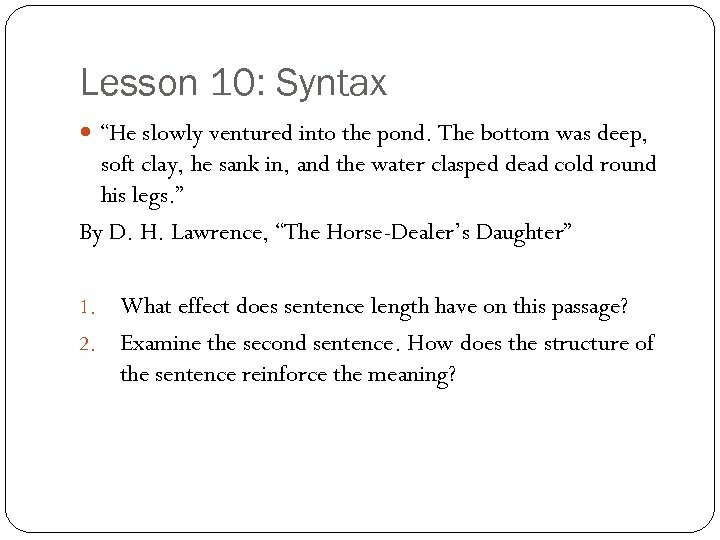 Lesson 10: Syntax “He slowly ventured into the pond. The bottom was deep, soft clay, he sank in, and the water clasped dead cold round his legs. ” By D. H. Lawrence, “The Horse-Dealer’s Daughter” What effect does sentence length have on this passage? 2. Examine the second sentence. How does the structure of the sentence reinforce the meaning? 1.